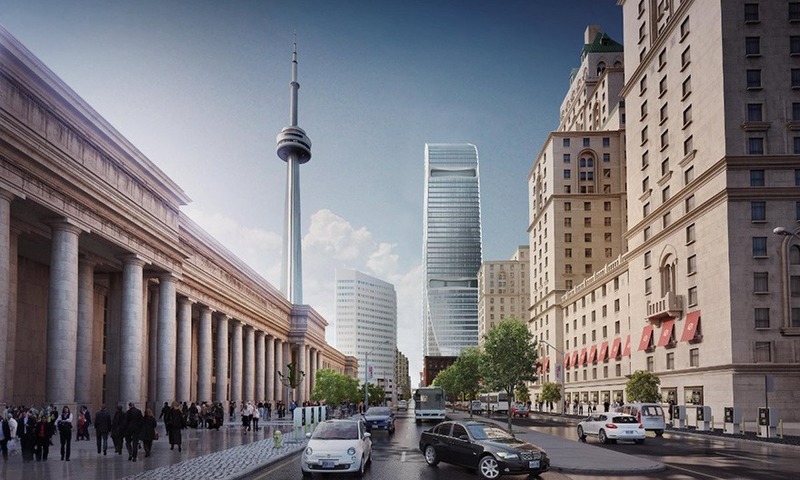 Cadillac Fairview (CF), in conjunction with the Investment Management Corporation of Ontario (IMCO) is pleased to announce construction of a new 46-storey office tower at 160 Front Street West, on the northeast corner of Front Street and Simcoe Street in downtown Toronto. The development, which represents CF’s continuing confidence in the city’s commercial real estate market, features 1.2M square feet of office space, 339 parking stalls, 12,290 square feet of retail space and is slated to open in the fall of 2022. The building’s inaugural client is CF’s owner, Ontario Teachers’ Pension Plan, which will relocate their head office from North York to 160 Front Street. According to CF, this latest development reflects the demand for high-quality, amenity-rich office environments across the country. “Our current momentum in commercial development speaks to a trend where best-in-class employers are seeking prime urban locations, and we take great pride in our ability to ultimately work with our clients to meet those needs,” said Mr. Sullivan. Cadillac Fairview currently has $1.5B of major office projects under development, including the $479 million building at 16 York Street in Toronto, the $200 million BMO Campus at CF Toronto Eaton Centre, the $60 million revitalization of 2 Queen Street West and the $25 million redevelopment of a former Sears location at CF Champlain in Moncton for TD Bank Group. Designed by world renowned Adrian Smith + Gordon Gill Architecture, in collaboration with B+H Architects as the Architect of Record, the building will offer a distinctive silhouette on the downtown skyline while meeting prospective clients’ desire for efficient design and environmental sustainability in both construction and operation. Incorporating the latest in smart building technology, 160 Front Street is designed to achieve LEED® Platinum and WELL Building Standard® certifications. Further, once operational, the building will be subject to the standards of CF’s award winning sustainability program, Green at Work®. Located one city block from Union Station and with easy access to the Gardiner Expressway, the site is wellpositioned to appeal to prospective clients concerned with ever increasing traffic congestion in the city and superior transit access. Nearby amenities include a diverse range of retail, food, restaurant and hotel choices. CF’s partnership with IMCO represents a continued collaboration on a number of projects on behalf of IMCO’s client, Ontario Pension Board (OPB). They include a new office tower under construction at 16 York Street in Toronto, as well as ownership in a number of existing office properties in Toronto and Vancouver, including RBC Centre and Toronto-Dominion Centre. Cadillac Fairview is one of the largest owners, operators and developers of best-in-class office, retail and mixed-use properties in North America. The company also invests in retail, mixed-use and industrial real estate in Brazil, Colombia and Mexico. With assets valued at more than $29 billion, Cadillac Fairview owns over 38 million square feet of leasable space at 73 properties in Canada, including landmark developments, such as Toronto-Dominion Centre, CF Toronto Eaton Centre, CF Pacific Centre and CF Chinook Centre. Cadillac Fairview has been wholly owned by the Ontario Teachers’ Pension Plan since 2000. Ontario Teachers’ is a diversified global investor and administers the pensions of more than 300,000 active and retired school teachers. For more information, please visit cadillacfairview.com or follow on Twitter @CadFairview. The Ontario Teachers’ Pension Plan (Ontario Teachers’) is Canada’s largest single-profession pension plan, with $189.5 billion in net assets at December 31, 2017. It holds a diverse global portfolio of assets, approximately 80% of which is managed in-house, and has earned an average annualized rate of return of 9.9% since the plan’s founding in 1990. Ontario Teachers’ is an independent organization headquartered in Toronto. Its Asia-Pacific region office is located in Hong Kong and its Europe, Middle East & Africa region office is in London. The defined-benefit plan, which is fully funded, invests and administers the pensions of the province of Ontario’s 323,000 active and retired teachers. For more information, visit otpp.com and follow us on Twitter @OtppInfo. The Investment Management Corporation of Ontario (IMCO) is one of Canada’s largest investment management firms with $60 billion of assets under management. Designed to serve public sector clients in Ontario, IMCO’s primary objective is to achieve long-term results that enable its institutional partners to meet their financial obligations to members and beneficiaries. The organization achieves this mandate by designing compelling and distinctive end-to-end investment solutions. IMCO’s clients include the Ontario Pension Board (OPB) and the Workplace Safety and Insurance Board (WSIB). Created in 2016, IMCO was established as an independent organization, operating at arm’s length from government and its institutional members, and guided by a highly experienced and professional Board of Directors. For more information, please visit www.imcoinvest.com and follow us on Twitter @imcoinvest.